Fortnite‘s 8.20 update has been released and it adds a bunch of new things into the game. 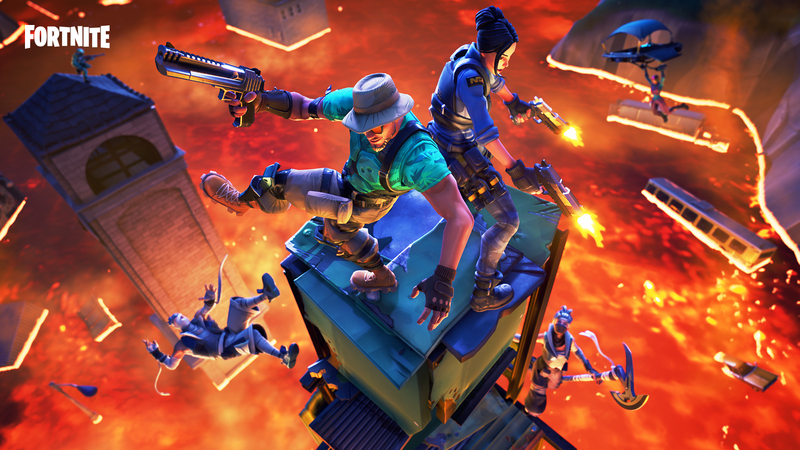 For starters, update 8.20 adds a limited time game mode called “The Floor is Lava.” In this mode, hot lava will rise higher and higher as time goes on, forcing players to collect gear as quickly as possible. They must then fight to survive using whatever height advantage they can find to ensure Victory Royale. Epic Games has stated that the lava will continue to spread until the entire map is covered. Naturally, touching the lava will damage you, and rather comically, will also launch you into the air. Epic Games has said that players can build on top of the lava, and that you will be given building materials gradually as you play, so you don’t get stuck without a backup option. Also included with Fortnite‘s 8.20 update are new items for players to use. The first of which, the Poison Dart Trap, damages enemies’ health directly, by-passing any shields they may have consumed. Its horizontal range is three grid-cells, and its vertical range is the equivalent of 4 grid-cells. The Poison Dart Trap can be found from Floor Loot, deals 10 damage per tick, and will have 8 total ticks over the span of 7 seconds, dealing a total of 80 damage. Additional hits will refresh the damage over time effect as well, so watch where you step! Update 8.20 even adds new Foraged Items into the game. Players can now forage Bananas, which restore 5 health upon consumption and can be found in the tropical biome, Coconuts, which add 5 health over a short time. If a player has full health, they will gain 5 shield instead. These can be found in tropical and desert biomes. Lastly, players can forage Peppers, which will grant 5 health and increase movement speed by 20% for 10 seconds., and can be found in the desert biomes. What do you think of the new “Floor is Lava” mode? Let us know in the comments below!